SCHEELS is your number one source for a name-brand quality outdoor adventures and sports gear, including equipment and accessories for several sports and other activities. We have baseball. basketball, football, golf, hockey, soccer, softball, volleyball, and other professional sporting gear. 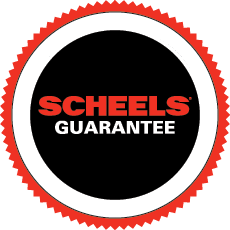 For cycles, we carry a wide array of SCHEELS bikes of all models, from kids’ first bicycles to high-performance racing bikes designed for speed. Fitness enthusiasts can browse our exercise machines, weight training equipment, nutrition products, boxing gear, aerobics and yoga supplies, massages and more. You'll also find a large selection of camping, hiking, and outdoor equipment, apparel and accessories to keep you safe, comfortable and well-protected in even the most rugged environments. Hunters will find everything they need for their sport, including archery equipment, knives and tools, blinds and decoys, trail cameras, hunting dog supplies and scent control. Firearm experts will discover all the accessories they need, from optics and scopes to protective gear.